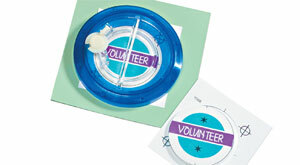 Badge-A-Minit Cut-A-Circles produce the perfect-size circle for your Badge-A-Minit buttons. Designed to cut to the exact measurement needed for Badge-A-Minit 1 1/4", 2 1/4" or 3" buttons, Cut-A-Circles are available in both manual and automatic versions. Manual Cut-A-Circles come complete with an adjustable blade to accommodate different paper thicknesses and a self-healing cutting mat to protect your tabletop. Automatic Cut-A-Circles work great for high-volume button-making and make circle cutting quicker and easier.